Summary: Ryan Shaw, the President and International Lead Facilitator of the Student Volunteer Movement 2, outlines ten essential spiritual keys for message bearers living godly lives while in cross-cultural ministries. These include being saturated with the powerful presence of God; embracing humility; hungering and thirsting for God; being clothed with God’s word; discerning God’s guidance and revelation; pursuing a lifestyle of prayer; cooperating with God’s two-fold purpose; understanding the times and seasons of God; persevering with steadfastness and stability; and pursuing a focused life. Shaw discusses each key in its own chapter and argues that they all require abiding in Christ the vine (John 15:4). Evaluation: I am using this as a textbook for my Intercultural Life and Work class I am teaching this semester and believe it could equip leaders who cross other cultural divides, like generation, secularism and sexuality, rather than just those involved in global mission. 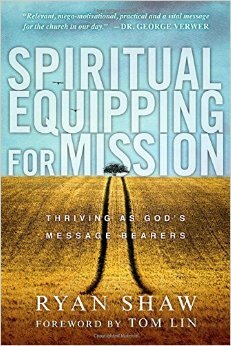 This book helpfully counters an exclusive focus on techniques, strategies and forms in mission (doing) by emphasizing the importance of the inner life (being). This is especially important as the integrity of an in-depth relationship with God is vital to sustain ministry, whether short-term or long-term, and often in contexts that can be overwhelming and stressful for the cross-cultural worker. Indeed, the book provides valuable wisdom and advice for getting through the “desert experiences” one encounters when working cross-culturally. Shaw’s book is likely to stimulate further conversation, particularly regarding the number and nature of spiritual keys he has identified. The areas of simplicity, confession and considering others could be developed further but the book is still a very good read. Another great quote from Goldingay.